Burgers R Us forges gourmet burgers on Broadway. 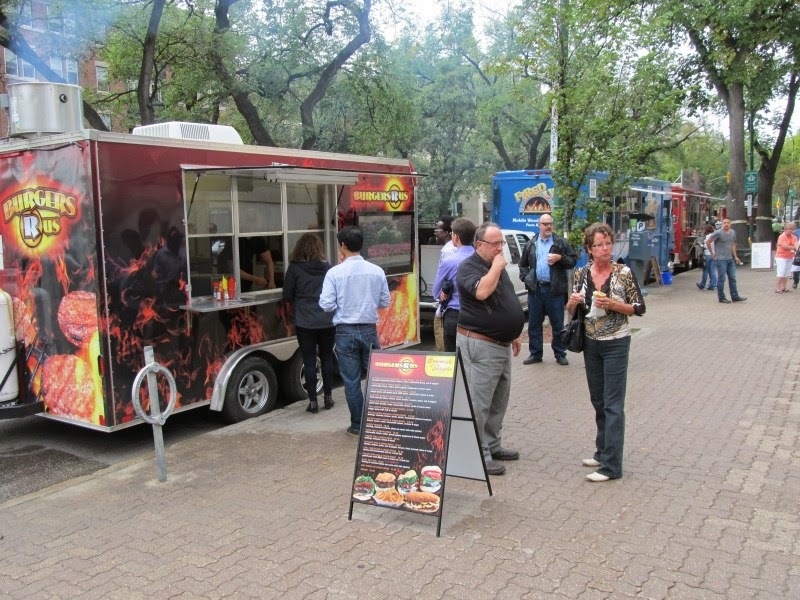 The flaming red truck offers an impressive nine beefy works of art on a bun, and Burger Club tried most of them. 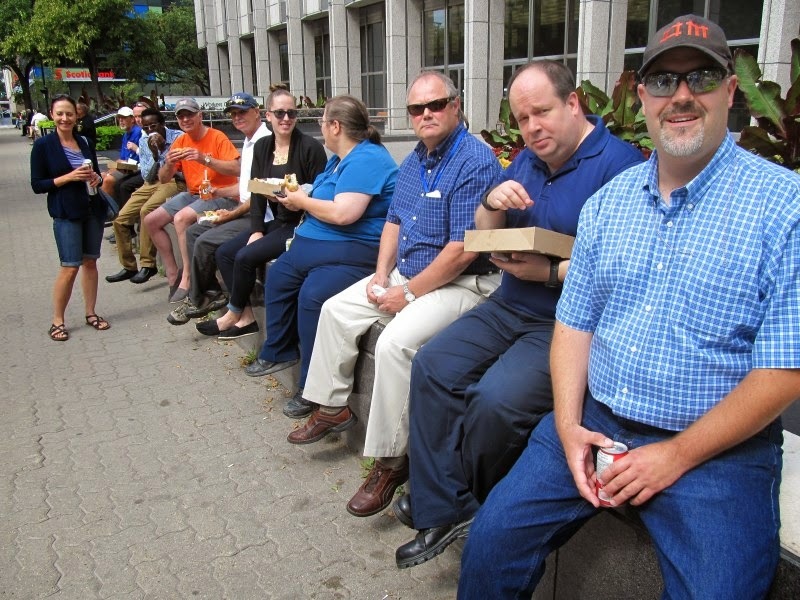 The day started out with a little rain, but the clouds parted so we could enjoy our burgers under the sun. 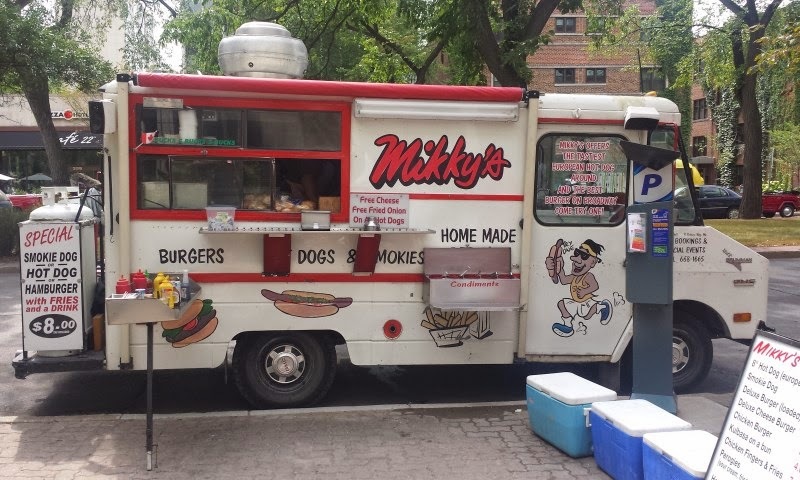 The truck wasn't always about burgers though. 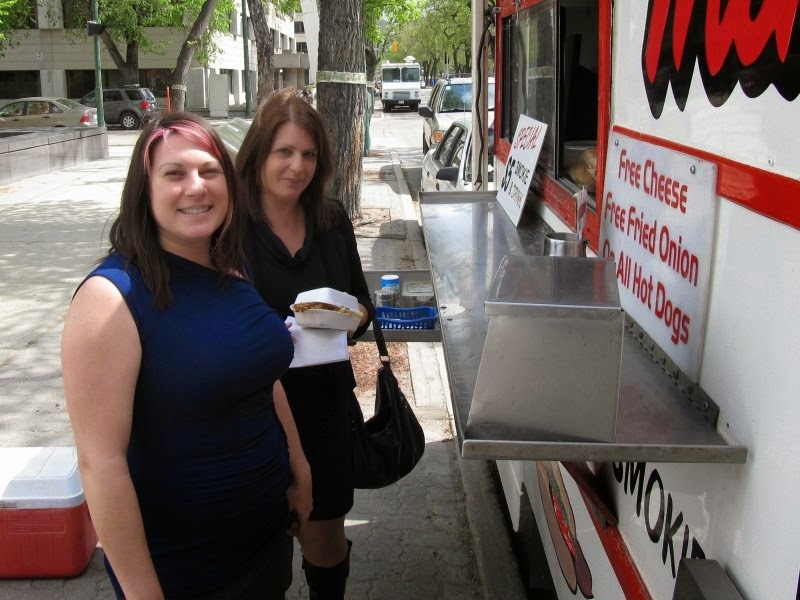 Sabrina and Blair McKibbon also own Healthy Eats and started a second rolling kitchen serving Portuguese food that my coworkers and I affectionately called the “Pork Chop Truck”. The meals were elaborate and sumptuous, but they realized quickly it wasn't going to work as a truck. A new flaming appliqué and menu and voila – homemade burgers for the Broadway crowd cooked up fresh by Blair’s brother Phil. 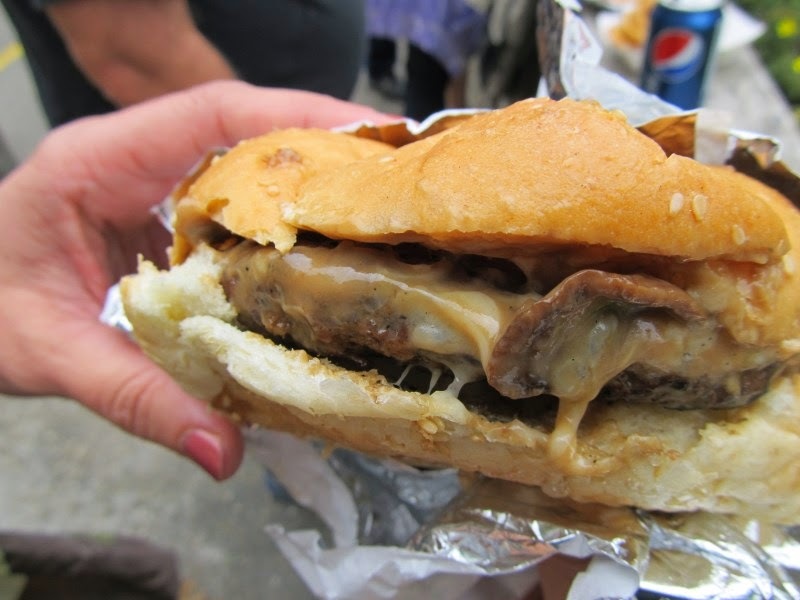 If you're shopping menus on Broadway, don’t be deterred by the $10 price tag at Burgers R Us. 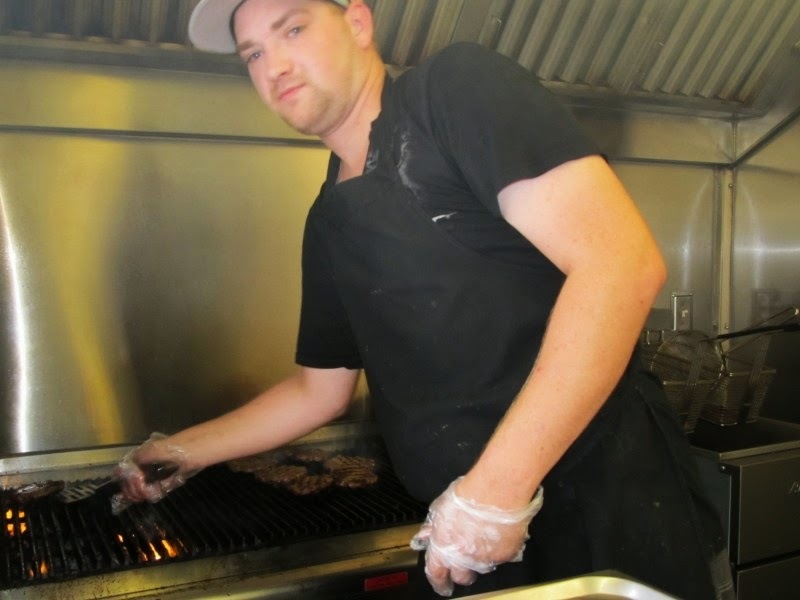 The beefy burgers are made fresh, flame broiled and easily twice the size of other truck patties. 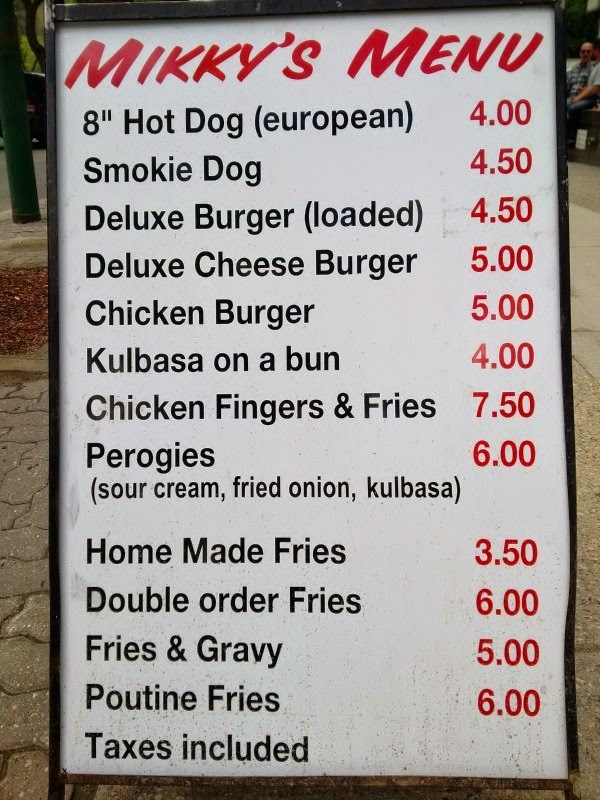 Everything on the menu comes with a side of onion rings. I assume the brothers farm onions in their spare time. I really enjoy a fresh onion ring, and these were piping hot and crispy delicious. 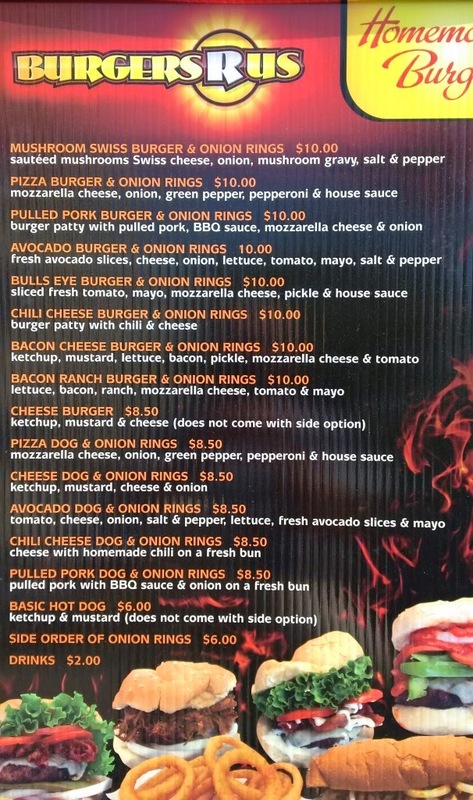 If you don’t want the rings, they’ll take $2 off the price of your lone burger. 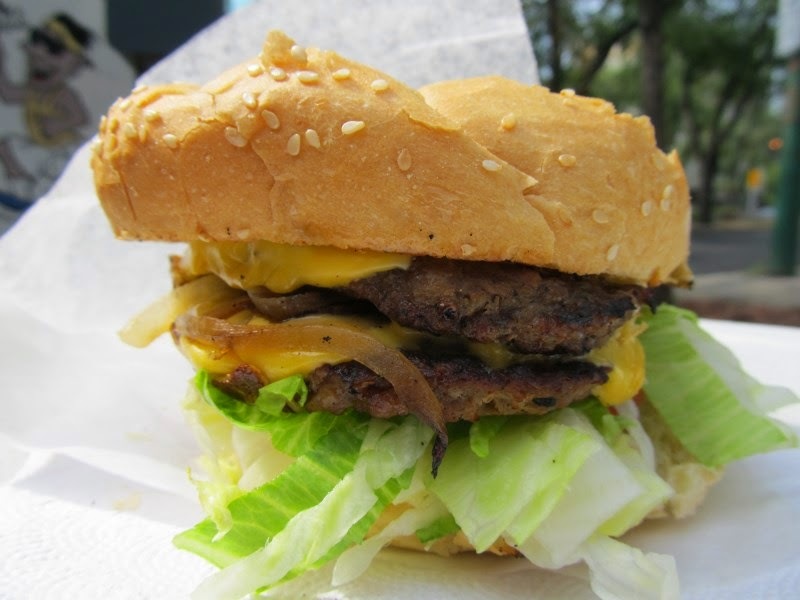 It can be a challenge to serve the lunch rush quickly, and a big thick patty takes time to cook. Burgers R Us flame broils the patties, places them in a steam box, then puts them back on the grill so you get your burger hot. When eleven of us showed up at once - as well as plenty of sidewalk surfers – Burgers R Us were handing out stacks as quick as they could assemble them. The sandwiches were passed out the trailer window wrapped in foil-paper to those whose number matched the call. The onion rings accompanied in paper trays like little super-hero sidekicks. 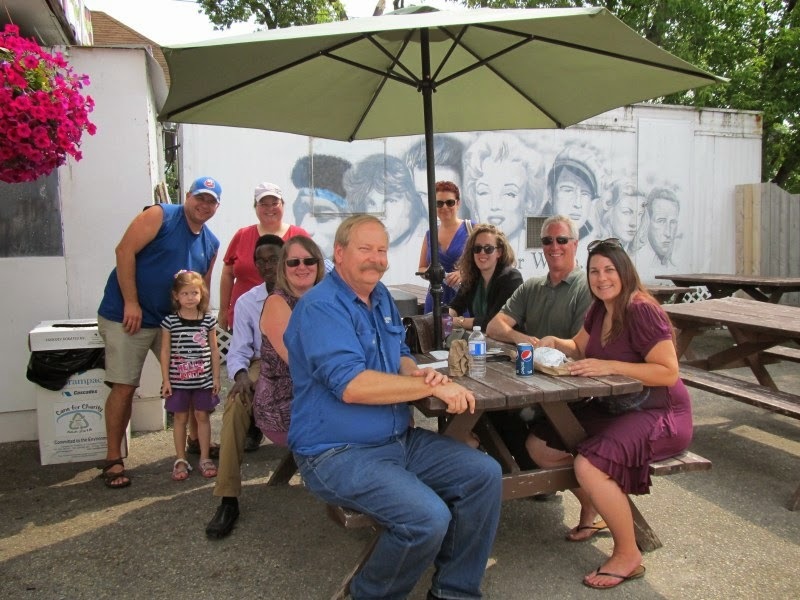 The “sitting wall” was still wet from the rain so we dined along a nearby fence which made a great burger bar. A couple of us had the Avocado Burger and were treated to two slices of bright green alligator pear. 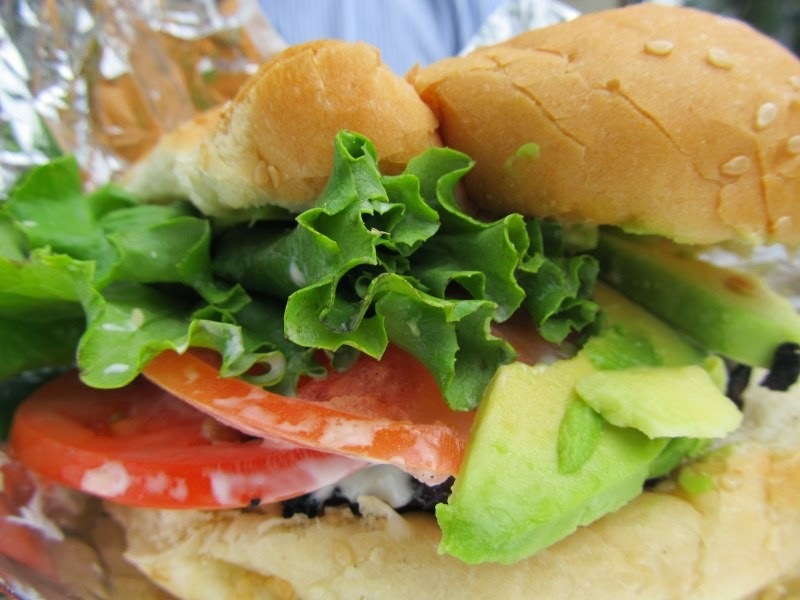 The bun was a soft, sesame Kaiser and the leaf lettuce and tomato were bright and fresh. 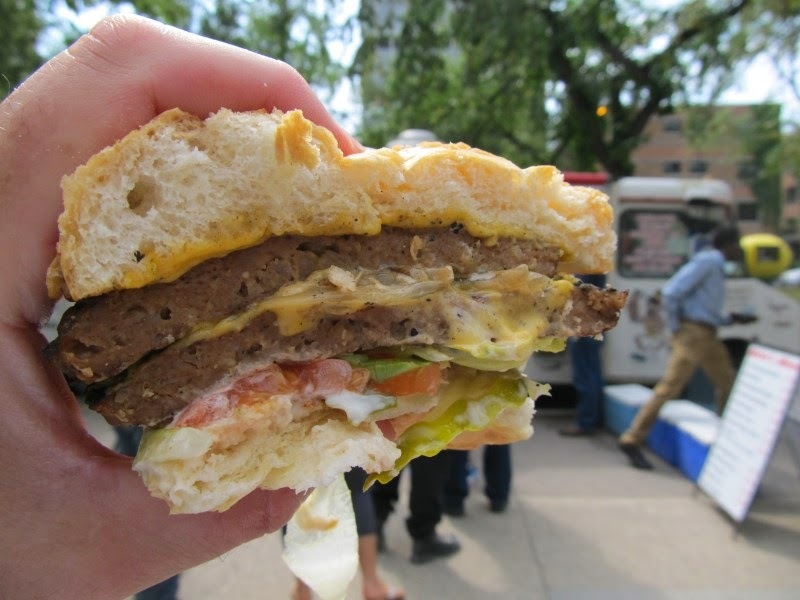 The patty was big and beefy, lightly charred from the flames and held together well. It was a filling burger that balanced well with the other flavours. 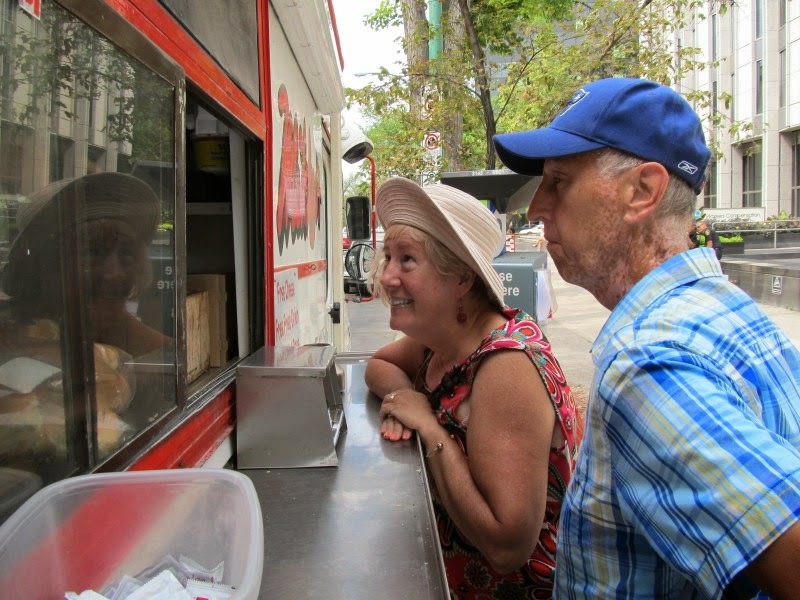 Mark had the Chili Cheese Burger: “All meat extravaganza; no veggies - love it! 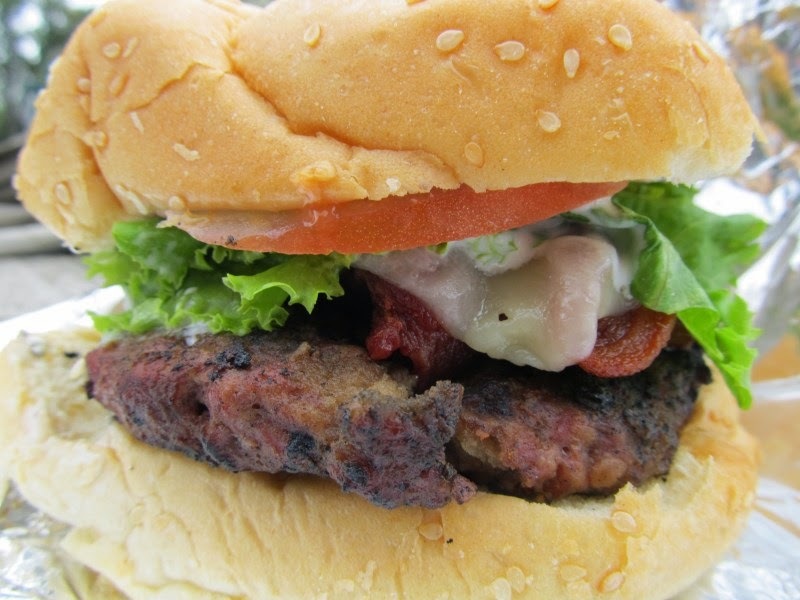 Excellent charred burger. 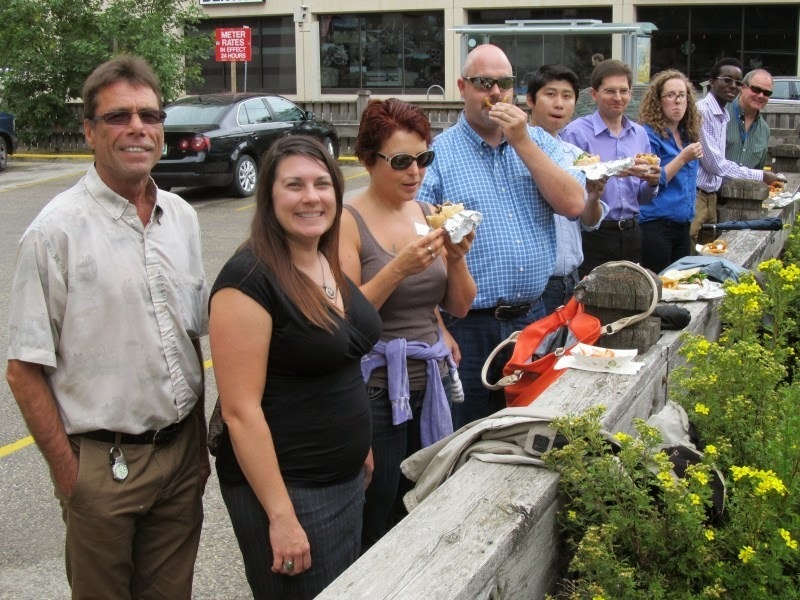 Real chili with a sweet flavour.” Burgers R Us make their own chili and pulled pork. 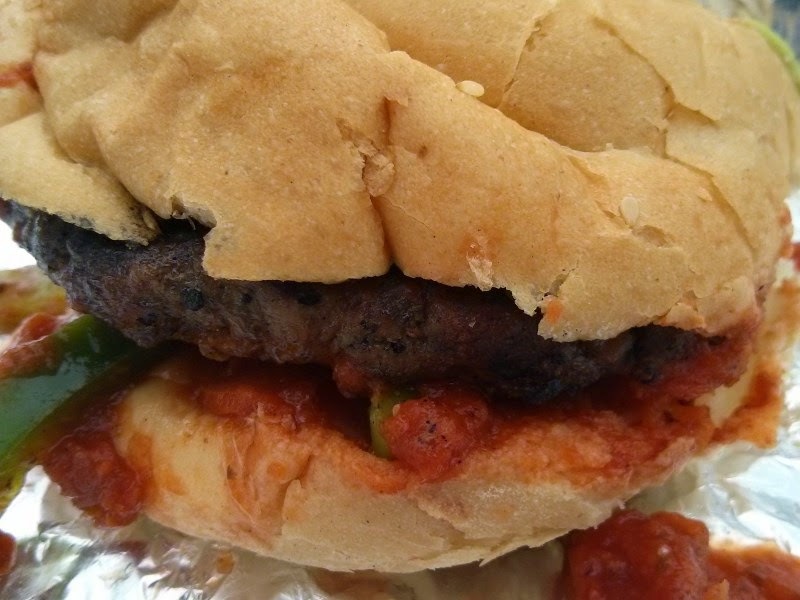 Stephanie said the Pizza Burger was “Fun and tasty” but the photo of the burger on the TV menu was much less messy than hers with its foundation of homemade pizza sauce running down the bun. Burgers R Us is usually the last food truck on Broadway. Phil and Blair told me how the parking patrol would start to get nervous around 2:30 pm. I asked how I could contact them and was handed a water bottle which confused me until I looked more closely at the flaming label – Twitter, e-mail address and a phone number for their sister trailer, Healthy Eats, that they can always be found with. Now that’s a handy business card on a hot day. 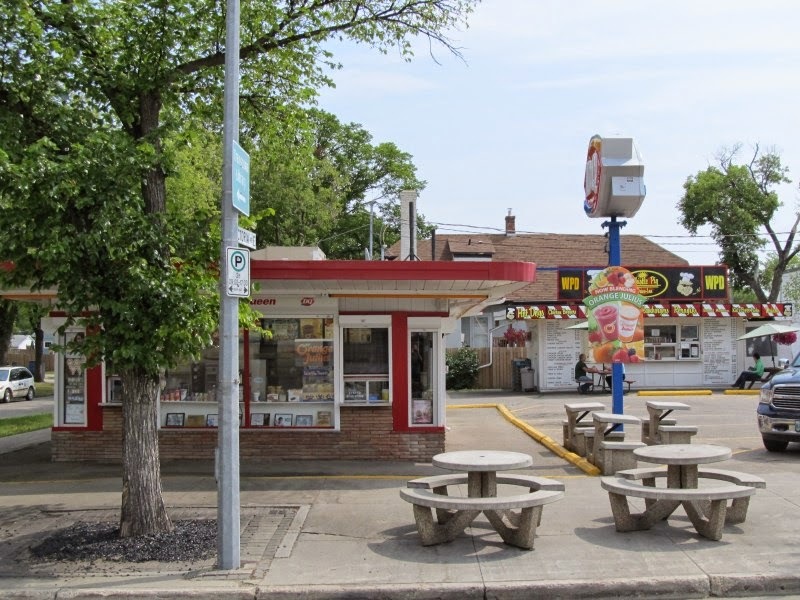 This week our mission of burgering under the sun led us to the Whistle Pig Drive-Inn (WPD) at 102 Victoria Ave E. Unicity tried and failed to assimilate Downtown Transcona, and as we passed under the arch, we knew we were leaving Winnipeg and journeying to some faraway land. 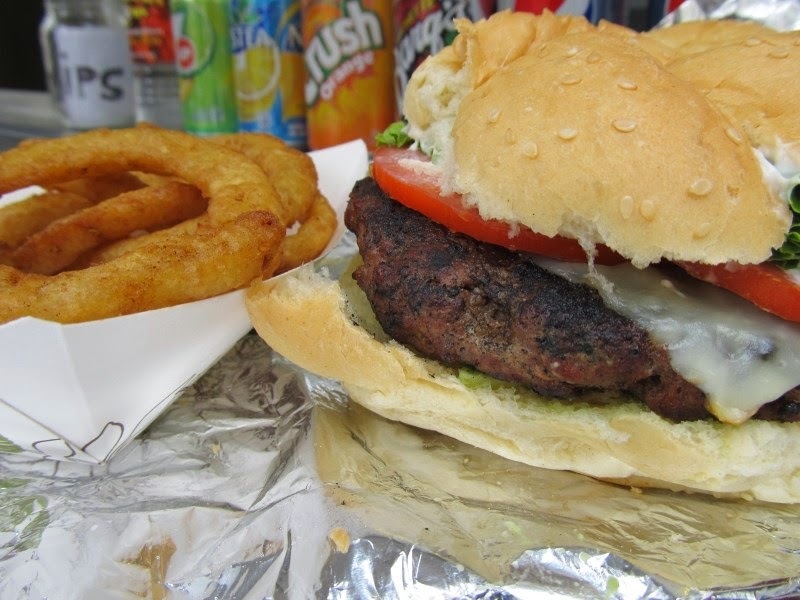 The WPD is a bonafide burger shack with a long history in the far east of Winnipeg. It’s had multiple owners and when asked, our window server said she didn't know where the name “Whistle Pig” came from. With a little research I learned it refers to a Groundhog. “Outside their burrow, individuals are alert when not actively feeding. It is common to see one or more nearly-motionless, standing erect on their hind feet watching for danger. When alarmed, they use a high-pitched whistle to warn the rest of the colony.” This seems like a sound survival technique and Burger Club will designate a Whistle Pig from now on while we loll in our meat comas. 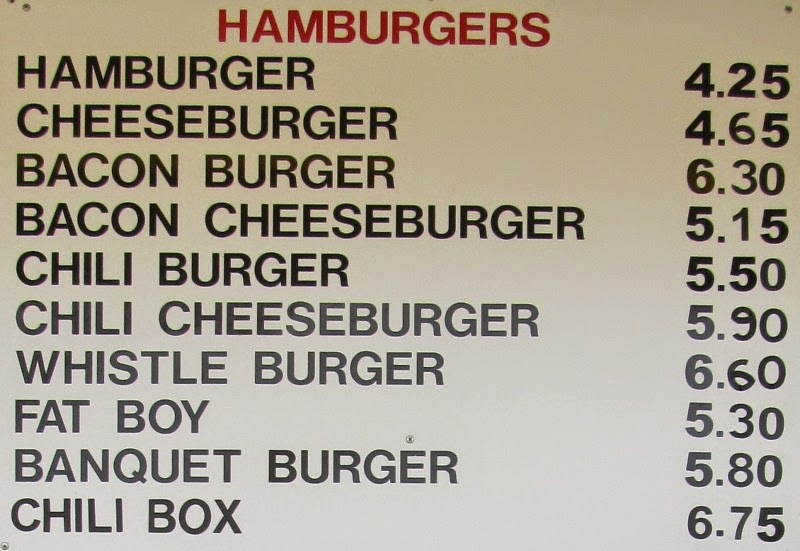 The basic burgers come with mustard, ketchup and relish with cheese\bacon options. The Chili Burger has chili sauce on it. The Whistle Burger has chili, cheese, double bacon and onions (no lettuce or tomato). The Banquet Burger has lettuce, tomato, cheese and bacon. The Fatboy is a banquet minus the bacon. 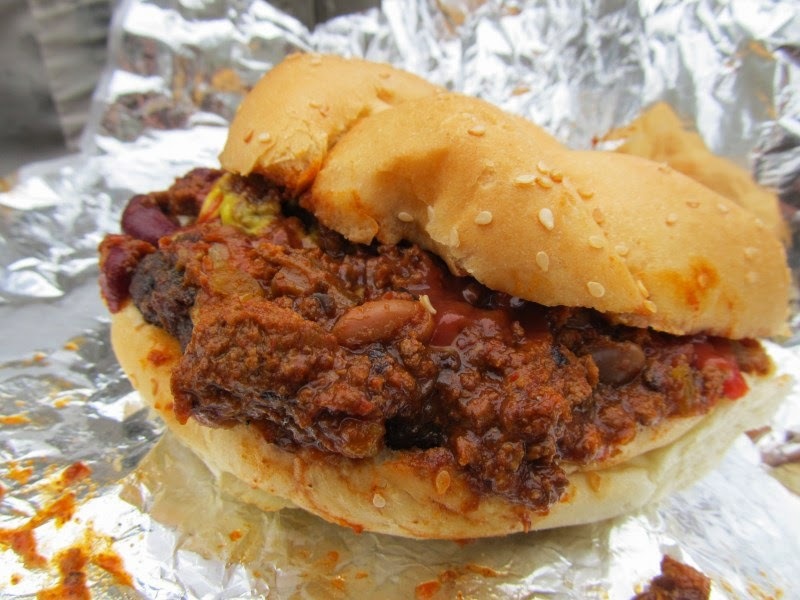 The Chili Box Burger is a chili burger buried in chili. The WPD suggested we pre-order to save time and that worked out well. 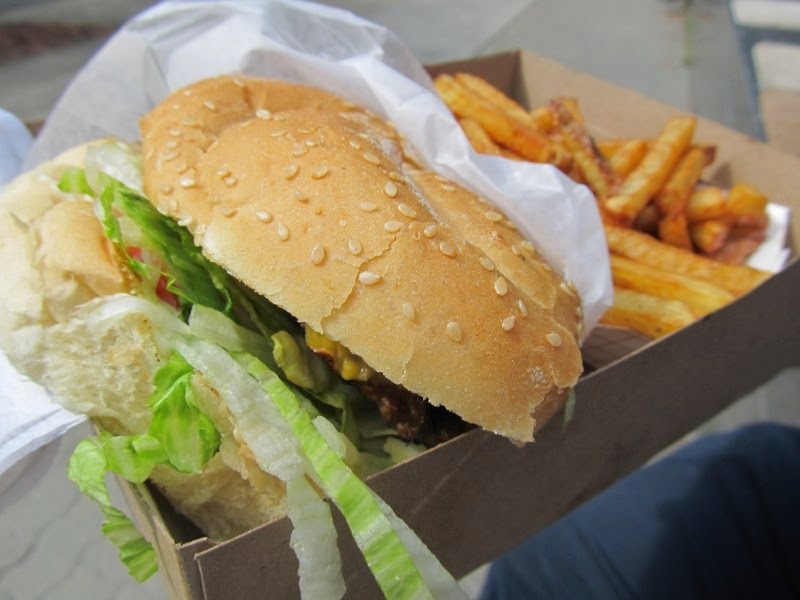 When we arrived our burgers were ready and waiting, wrapped in foil-paper and delivered in splendid brown paper bags. Dani commented it was a “Beautiful, sunny day in Transcona. 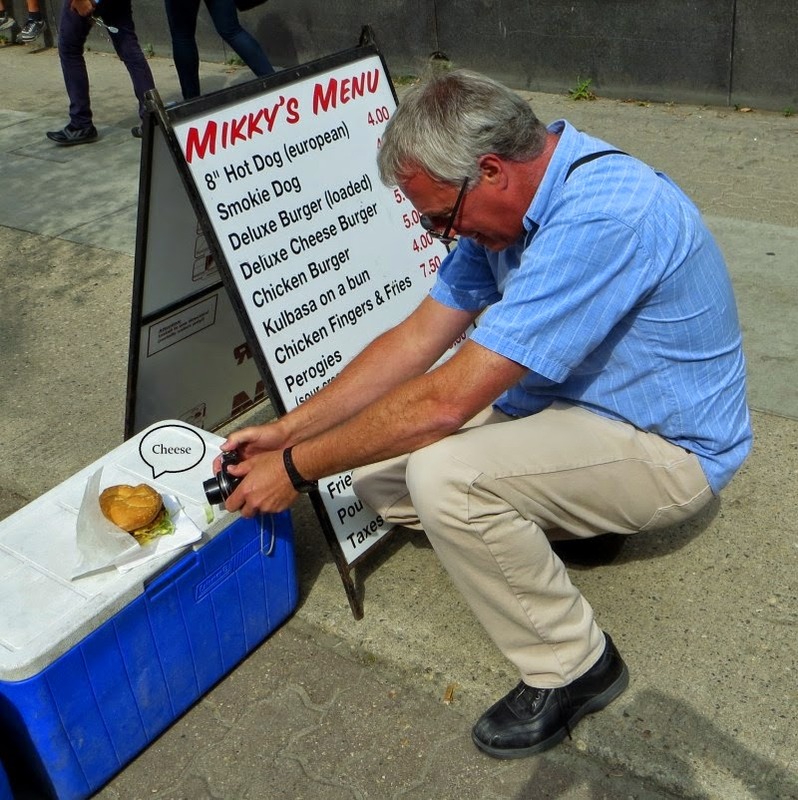 A great day for a window service burger.” There were lots of picnic tables with umbrellas for us to dine at. The patio’s overlooked by the Beatles and a mural of past icons that challenged our memories. A wonderful feature of the WPD is that it shares the parking lot with a DQ and as everyone knows, burgers should always be followed up with ice-cream. 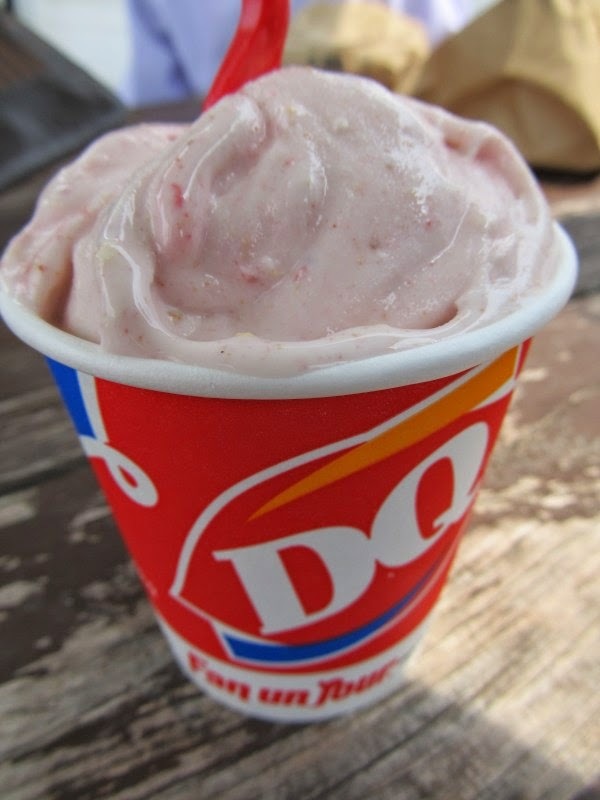 A few folks opted for a strawberry cheesecake flavoured mini-Blizzard. All’s well, that ends well!